The policy options that the PAP government decided for handling the haze are in consistent with its usual pragmatic approach. In such a way it also reflects the good, bad and ugly sides of the PAP. However its consistency with old (capitalist) practices also means it has not caught up with times. The usual pragmatic policy taken in the past caused no big problems for the old Singapore – citizens trusted the government, believed it could deliver and handled the situation well. However, with a new political norm, the policies and strategies that the government adopted recently seem to be a public relations failure. Issues of public (mis)trust and (loss of) confidence appear. 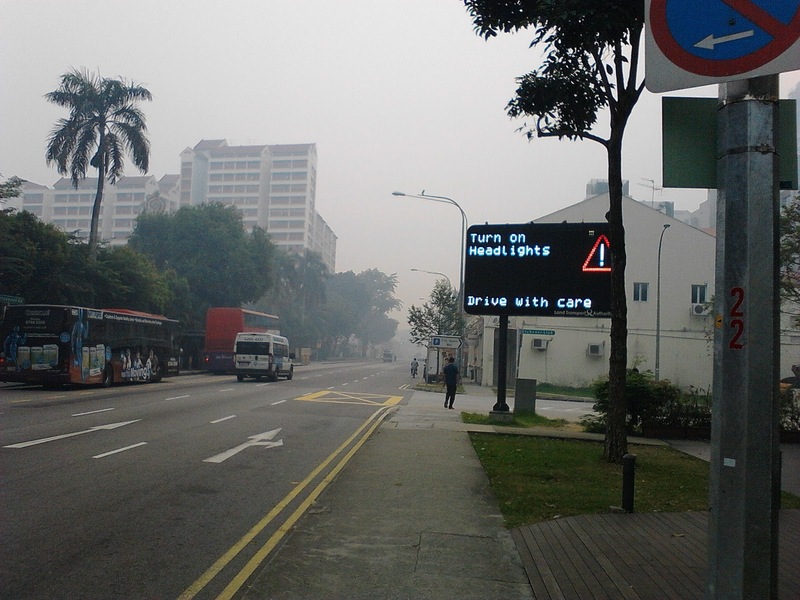 People begin to ask whether the PAP can effectively solve the haze problem. The PAP is the usual PAP. It has not changed. However, the people have changed with different demand and expectation. They want accountability for high salary ministers and senior civil servants. They want to see them coming out with creative and workable solutions – not like the past a haze problem can be unsolved for more than 20 years. The questions are:- Whether we should use the maximum or the average of 24 hours. - Whether we should give more emphasis to PM2.5 and why it is not widely published. - Why stop work order is not announced when PSI hit more than 400. - Both PSI and PM are outdated measurements. - Why the distribution cannot be done earlier and for free. - Why it has to go through commercial organisations for profit making. - Why must it go through PA, grassroots and PAP MPs? Singapore behaves like a child and ESM Goh’s reply is also like a child. Different from the past, in the social media, there are advices on the health prevention and solutions to the haze problem. They may not all be correct or some may even cause confusing as claimed by the PAP. Nevertheless, more people are showing concerns for Singaporeans and our health. This means the active citizenship is still there but may not with the government. If you are PAP supporters believed in mainstream media, you would give a good remark or an A grade to the PAP for handling the haze problem well. You believe in things of the past. The government has distributed the masks FOC to the lowest income families. They get in the army to help and ask businessmen not to make extra profits. They even form the inter-ministry Haze committee and protest to the Indonesian government by delivering a personal letter. And yes, they are doing or handling it no difference from the past – quick, efficient, well coverage in MSM, providing proper advice and assistance. If you are a netizen or believe in alternative views, you will judge the government differently. Most likely you will give a bad score or an F grade to the PAP. If a problem can last more than 20 years or longer, it cannot be considered a problem anymore. Rather, it has become a certain happening. 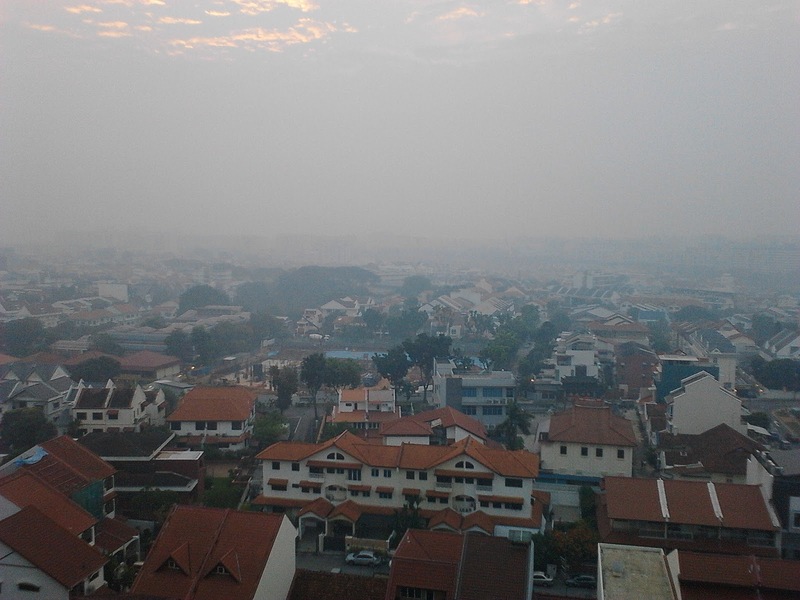 There is certainly a foreign policy failure as we have no control of the haze. We can blame it all to the Indonesian government but do we understand them well? Have we showed real and sincere concern about Indonesia and its people? If you are a social activist or a person seeking social justice, the PAP is presenting its ugly side of its policy options. Outdoor working like construction under PSI400 and above is certainly very inhuman. Even the medical subsidy of $10 for haze related illness is insufficient, especially when you consider the long-term care and a prolonged haze problem. The haze problem exposes the good, bad and ugly sides of the PAP. The problem now is how many people believe the PAP is handling the issue the right and effective way. The sudden disappearance of haze is due to the change of wing direction. So, it is luck. Will the luck always at the side of the PAP or with the people? Or will the PAP like the lucky President who got elected by a very small margin? However, President Tan has noticed the full moon and the helping hands of Singaporeans. Haven’t you? 【"Singapore should not be behaving like a child and making all this noise," Agung Laksono, the minister who is coordinating Indonesia's response to the haze crisis, told reporters in Jakarta. "This is not what the Indonesian nation wants, it is because of nature." The minister for people's welfare also said Jakarta would reject any offer of financial aid from Singapore unless it was a large amount. Closing down state broadcaster, what does it mean? The Greece Prime Minster wants to close down the state broadcaster ERT but the decision was overturned by the highest Court. It, of course, has nothing to do with Singapore. However, if we look further into the issue, it has many meanings to us. In Singapore, it is out of imagination the PAP government will close down Mediacorp and its television and radio stations. So, why does the Greece government think otherwise? A Prime Minister is accusing his state-owned broadcaster “lack of transparency”. While in Singapore, this will never happen as we all know the clear position of mainstream media. It will be very interesting to find out why the government owned broadcaster in Greece becomes “lack of transparency”. Is it because of the multi-party politics and frequent changes of government leading to the broadcaster does not know who is the “real” master? If the state broadcaster is to be closed down, it means the existence of state television and radio stations has very little value to the government. Just ask yourself can the PAP live and function without the MSM? Of course, not. The Greece PM must have found alternative media to communicate to the people. There are, of course, alternative private broadcasters in Greece which can help the government to do the transmission work. However, the most important contribution is the Internet and social media. Government can communicate with the citizens through Facebook, twitter and other social media. The future development of social media will be an effective alternative to traditional media. Perhaps, in the case of Greece, this is the reason why even without a state broadcaster, there are other communication channels that can effectively communicate government policies, rules and regulations, changes in administration procedures etc. to the people. Considering this development and the recent MDA new licensing requirements, you can easily guess why the PAP has to come out with the new security bonds and notice on removal of articles. The PAP is still very tradition and does not know how to face the challenges and development of social media in Singapore. Another interesting about the Greece story (full BBC report below) is who will protect the job of the broadcaster workers. The government says no and is ready to fire the workers. The union has come forward to file the case in the Court. It is interesting to see the outcome of same case in Singapore. If the PAP wants to close down Mediacorp, will the union in Singapore protest and file the case in the Court? So, union members may have privileges in club facilities and bookings, but whether their rights are well protected or not is another question. If the same case goes to the Court in Singapore, what will be the outcome? The Greece Court seems to give a win-win ruling. [A Greek court has ordered that state broadcaster ERT, which was shut down by the government last week, can resume transmissions. The union wins in short term and the government wins in the long term (by end of year). Is this win-win ruling showing the independence of the Court in Greece? Or all of them are playing politics. A Greek court has ordered that state broadcaster ERT, which was shut down by the government last week, can resume transmissions. However, the court also upheld a plan by Prime Minister Antonis Samaras to replace ERT with a smaller broadcaster. The ruling came as Mr Samaras and his coalition partners - furious that they had not been consulted about ERT's closure - held crisis talks. The prime minister's decision triggered mass protests across the country. The leading party in the governing coalition, the conservative New Democracy, said last Tuesday that ERT suffered from chronic mismanagement, lack of transparency and waste. It shut the broadcaster down with the loss of nearly 2,700 jobs. Viewers saw TV screens go black as the signal was switched off. Greece's top administrative court - the Council of State - upheld Mr Samaras's plan to replace ERT with a new broadcaster later this year but backed the position of the other coalition partners that the signal must be restored in the interim. Some ERT journalists have continued live broadcasts unauthorised over the internet, and when the ruling came through, a strapline across the screen said: "In a few hours ERT will be broadcasting everywhere." The case was brought by ERT's union in an attempt to overturn Mr Samaras's surprise move. The BBC's Mark Lowen in Athens says each side will claim victory, but in the end the unity of the government has been badly weakened. During talks, Mr Samaras had suggested a new, leaner, cheaper broadcaster would be established within weeks and he proposed hiring a small team to produce news programmes in the interim. But this idea was rejected by his two coalition partners - Evangelos Venizelos of Pasok and Fotis Kouvelis of the Democratic Left. "The court decision is essentially in line with what we've said: no one has the right to shut down national radio and television and turn screens black," said Mr Kouvelis after the emergency talks ended. Mr Venizelos said they would meet again on Wednesday to discuss a cabinet reshuffle. An official from New Democracy said the ruling affirmed the government's position that ERT had been scrapped. The row has threatened to topple the government and force Greece into snap elections, triggering political turmoil with implications for the whole eurozone. ERT workers celebrated outside the broadcaster's headquarters after hearing the court ruling. "I've been here seven nights and this is the first time I've seen people smile," said reporter Eleni Hrona. However, our correspondent says there is also the recognition that later this year many will lose their jobs as a smaller broadcaster is formed. Meanwhile, as coalition leaders went into talks, the main opposition party Syriza held a rally in Athens' Syntagma Square to demand early elections. There are quite a number of flats that need a fresh look under the Repair and Redecoration programme at Paya Lebar estate. The money, of course, comes from the sinking fund – part of the monthly maintenance fees that we pay to the town council. I believe this is the first time residents will have the options to select the colours of our flats. Under the PAP town council, decision was made under the group thinking of grassroots leaders, CCC, RC and MPs. They made decisions on our behalf and the contractors carried out the painting accordingly. Now, you compare this to the new MDA licensing. The government wants you to read the “right things” and there is a group of officials who will decide the “right things” for you. You have no options like the residents of the old (PAP) Aljunied TC. The TC made the decision and chose the “right colours” for residents. Yes, it is very efficient and even very environment friendly (there is no need to print the option forms). But is it the “right colours” that are preferred by the residents? I am not saying by giving 4 options (see below) the WP is doing the excellent work. At least, there are options and WP knows that there are improvements to be made. And surely, if there are good and better suggestions, WP town council will listen and make improvements. In the eyes of the PAP, options are bad and less efficient for decision making. The new MDA licensing and future changes in rules and regulations regarding social media reporting on Singapore news will leave netizens with one option – the right news. And the persons who decide the right news are not independent, certainly not the netizens themselves. So, Aljunied voters face an interesting question: Do they want to go back to “no option” PAP town council of the past or continue to vote for a WP town council with at least 4 options in 2016? Like the netizens, the answer is quite obvious. 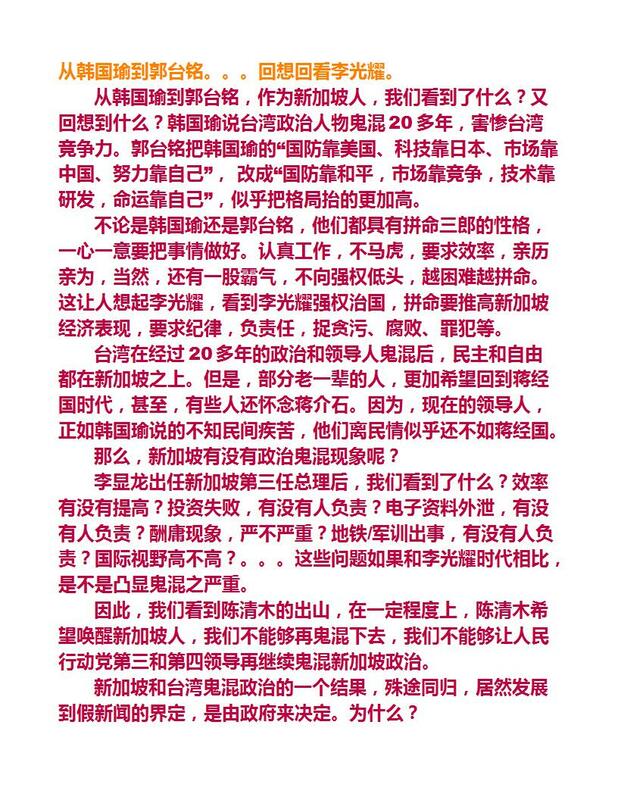 It is not surprised that bloggers and netizens are angry with the new MDA licensing. It is telling the whole world we are going back to the old regime of controlled press and media with one option. While we already know we have options for alternative news and opinions. In 2011 GE, it was a child thinking to assume that there was no nonsense or nuisance if WP won Aljunied GRC. Aljunied voters had been pressurized to think twice of the consequence. They know too well the warnings and threats Hougang voters received from the PAP. From the AIMgate to the recent hawkers’ dispute, voters here are psychologically prepared for all these nonsenses and nuisances. And we are expecting more to come. Compare this to the new MDA licensing again. What you will see the right things will be the MND report on AIM, the NEA side of story, the original version of Population White Paper and many others like the (not real) wage increase, (unaffordable) housing, education, health etc. Without alternative news and analysis, without social media, and with only the main stream media, you will have no option at all. 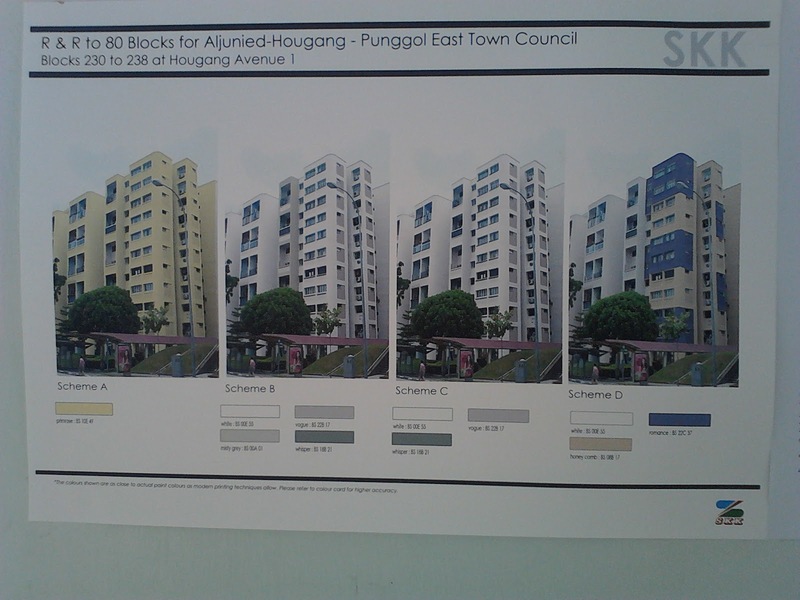 The case of colour options in Aljunied reminds us the importance of options, alternatives and choices. The government cannot assume it is doing the right thing without proper consultation and feedback from the people. Its decision on making the right things for the people is a past tense. Just imagine if Aljunied GRC were still under the PAP management, the right thing they will do is to choose the right colours for the residents. And then they proudly claim that this is the product of their group thinking after getting feedbacks from the people. So, remember if you really want to have options for alternative news and analysis, you will have to vote like the voters in Aljunied, Hougang and Punggol East. At least, you are telling the PAP you know (and decide) the right things and not the imposed PAP right things. What do you think? Options for alternatives or no option likes the PAP. How come the “Finest” worth so much at NTUC Finest –is it having the same group thinking as the PAP? Finest or not, after all NTUC is still a co-operative. A co-operative even how fine it is it is still a cooperative with the objective of helping the lower income families, the people at large and ordinary citizens. I am shock to find out the renovated Hougang A NTUC Supermarket now renamed as NTUC Finest can offer ordinary items as expensive as the nearby Cold Storage or even dearer. Perhaps, NTUC has forgotten they are a co-operative, a social enterprise, as PM Lee and union leaders have also stressed. NTUC is to help citizens to fight inflation and lower down the cost of living for Singaporeans. And now the word “finest” means expensive after a name change and renovation. It looks like NTUC is just doing the opposite (finest in price only), just like the HDB housing and the hawkers’ stalls. After upgrading with new design and facilities, HDB demands higher selling prices for HDB flats or higher rental of hawkers’ stalls. Price adjustment always comes after renovation or upgrade. The PAP does it so do the NTUC. Here are some selected daily items and their price differences between NTUC Finest and Supermarket. Before the renovation in May 2013, the Hougang A NTUC Supermarket offered the same prices as the other two stores in Toa Payoh and City Sq. In term of location and rental, I don’ think Hougang A is in a better location and having to higher rental. I also doubt there is a rental increase after renovation. But consumers have to pay for the renovation costs and the “finest” goods and services. 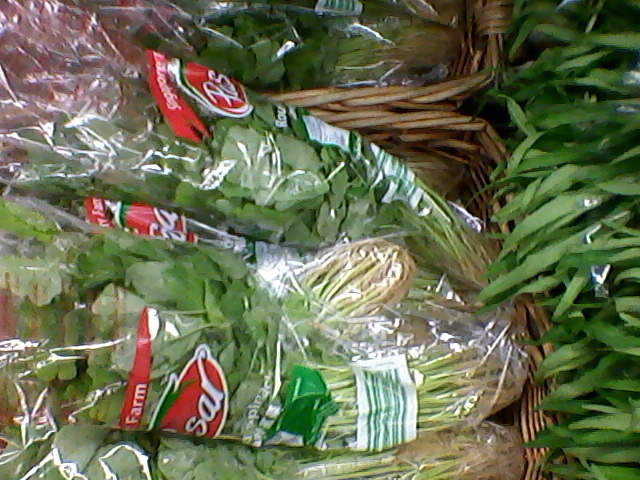 I don’t see the difference in quality (for spinach I brought at NTUC Finest) or service. In fact, the price tags were not displayed for the spinach and so as regular customers, I don’t pay attention even there is no listing of price. I only notice the difference after payment. 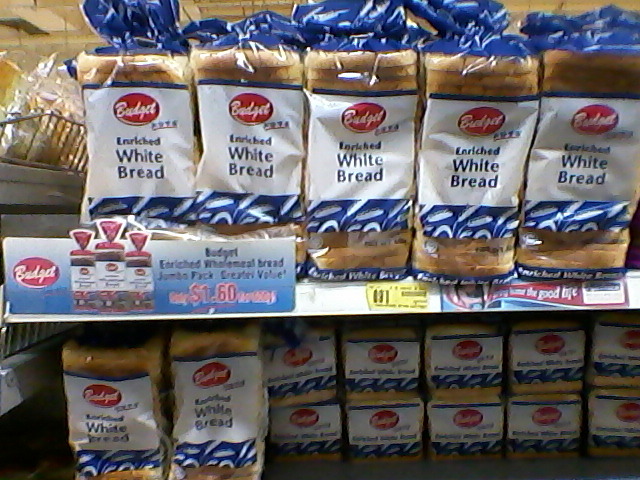 If the price adjustments for some daily necessaries can increase by at least 10%, plus the cheapest range of products, like the blue packaging house brand bread, are not on offer; how can NTUC Fair Price help to lower the living burden of common people. Not to forget in the neighborhood of Kovan MRT, there is only one NTUC Supermarket (now Finest). This means residents have to go to both expensive supermarkets (Cold S and Finest) for their daily needs. If you are the only supermarket, with a social enterprise spirit of fighting inflation, in the neighborhood, why are you running away and joining the commercial enterprise and forming the oligopoly competition in the area? If there are two NTUC Fair Prices in the same area, then the rational of one goes upmarket and the other serves the lower income people seems logical. But the situation near Kovan MRT is different. There is only one NTUC. Quite obviously, NTUC Fair Price is doing the same thing like the PAP government. They have the same group thinking, whether running the country or running a social enterprise. The name “Finest” has many implications. For medical care, lower income families are facing Class C or B options, or for middle income families the choice of government or private hospitals. For education, students can go to the “finest” independent schools, or neighborhood schools. For HDB, you can apply for the “finest” EC flats or normal HDB flats. For COE, you can go for the “finest” above 1600cc cars or small cars. So, shopping at NTUC, you still have an option, you can go to the Finest and spend more or go to a normal supermarket but you may not get one in your neighborhood, like the case of Kovan MRT. Yes. The government supplies options, choices and alternatives, but like the Hougang A NTUC Finest, you may not have the opportunities to shop at the NTUC supermarkets elsewhere. However, if you insist to do so, you will have to spend more time and money travelling to the nearer NTUC supermarkets outside your neighborhood. Kovan MRT is within Paya Lebar –Aljunied GRC. One reason I can think of for the renamed NTUC Finest is NTUC has quietly upgraded the Aljunied residents and voters to the finest people in Singapore. We are now giving the chance to shop at the finest supermarket. Of course, as customers and residents, you too have to be “finest” too. But there is (an expensive) price to pay for getting this finest honour by shopping at Hungang A NTUC Finest! Perhaps, same to the PAP too! It will be another expensive lesson to learn from (not) helping Singaporeans.